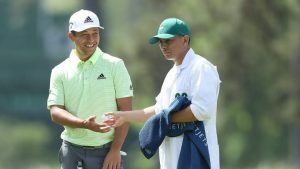 Last week, Bob and Popi Kaiser of San Miguel went back to the Masters Golf Tournament in Augusta, Georgia to watch their son, Austin, caddie for Xander Schoufele, a 25-year-old currently ranked #10 in the world. Growing up in the North County, Austin Kaiser was obsessed with golf. At the age of 3, he took his father’s clubs and whacked golf balls around the yard. Later, Austin spent a lot of time at Chalk Mountain Golf Course, and played golf for Atascadero High School. When he graduated, he played for Alan Hancock College, and earned a golf scholarship to San Diego State, where he played with teammate Xander Schaufle. He graduated with a degree in criminal justice with the intent of becoming a detective with the San Diego Police Department. Before he got a job in law enforcement, however, Xander called to ask if Austin would be his caddie. That has turned out well for both young men. Xander has won two tournaments so far this season. Yesterday at the Masters, Xander finished in a tie for second, one stroke behind Tiger Woods, who won the tournament. Monday, Bob and Popi Kaiser return to the North County after an exciting trip to Augusta, Georgia. Popi says, “It was great to spend time with Austin. We’re very proud of him, but I look forward to getting back to Cider Creek Bakery.” Popi is an owner/manager at the bakery in Paso Robles near Kennedy Fitness Center.